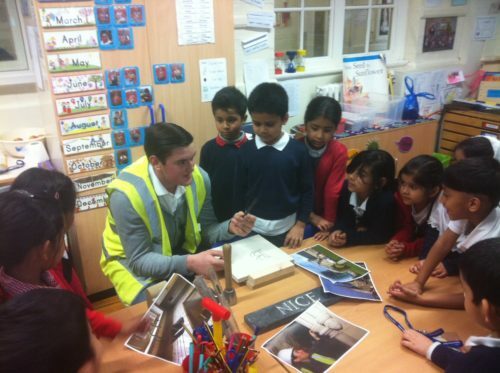 As part of the Skills Funding Agency Primary Futures Project BCC apprentice stonemason Olly Bunn gave demonstrations of stone cutting to young pupils at Mayflower Primary School in Tower Hamlets. Olly is a second year stonemason employed by JF Stoneworks and was a great hit with pupils. A speech on the value of apprenticeships was given at the event by the Prime Minister’s special advisor on apprenticeships Nadhim Zahawi MP. Tutor Nancy Peskett attended the event with Olly and said “the Primary Futures event yesterday was a big success, with a good speech from the Prime Minister’s Apprenticeship Advisor, and great feedback from staff on Olly’s stonemasonry demo”.